Lindsay first became aware of the importance of long term care planning when her grandmother had to sell the family home of nearly 40 years in order to qualify for Medicaid. Several years later, in law school, Lindsay served as a teaching assistant and discovered a knack for explaining complex legal issues in a clear and engaging manner. She applies her experience with her grandmother and her skills as a Teacher's Assistant today as a member of the Ettinger Law Firm where she endeavors to make the long-term care and estate planning process more comfortable and comprehensible for her clients. Lindsay understands that strong client relationships are just as important as knowledge of the law. She believes that understanding each client's unique situation is the key to making the appropriate individualized recommendation. 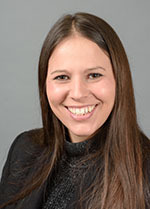 Lindsay earned her JD from Albany Law School after her professors at Rockland County Community College's Paralegal Program suggested that she pursue a law degree. She holds a Bachelor of Arts in Psychology from Susquehanna University in Selinsgrove, PA.
Lindsay is a native of Goshen, NY and currently resides in Nyack.